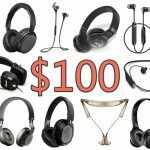 Budget – Although we’re at a $200 or less ceiling here, there’s still a big difference between a pair that hits the mark at $200 even and a pair of Bluetooth headphones under $100. We always recommend going as high as you can, although the particular pair you find that stands out may be the deciding factor on this. We did our best to cover our tracks in all $200 or less price-tag ranges. Bluetooth Over-Ear: What most individuals consider to be ‘headphones’ — these are the traditional build of headphones, with a big headband a top of your head and large ear cups that surround your ears to submerge your head into the listening experience. Many love these for the privacy and immersive experience. 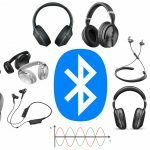 Bluetooth On-Ear: Sometimes confused with over-ear, on-ear headphones have slightly smaller ear cups that don’t go around your ears, but instead on top for a different type of feel, sound and overall audio experience. Some prefer the sound isolation of on-ears better and feel the fit causes less pain after frequent use. Others prefer over-ear since you have more of a private hearing vehicle. Read our on-ear vs. over-ear headphones guide if you’re even more confused now (sorry!). Bluetooth In-Ear: Many calls these earbuds and we won’t confuse you any further (since there is indeed a difference between earbuds and in-ear headphones); however, in-ears are the smaller types of headphones you see many wear at the gym, while traveling or really any time they need some more versatility as compared to over-ear and on-ears. We have quite a few of these below. 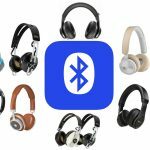 Battery time – Bluetooth headphones are hit or miss when it comes to overall ‘battery playing time’. The average for on-ear and over-ear headphones are going to be much higher than others (typically into the 15-20 hours range) since they can fit larger batteries in the bigger design. In-ear headphones are a lot smaller and can fall between 6 to 12 hours, so this may be important for you and a deciding factor depending on your intended use and foreseeable environment. Additive features – Aside from money, design and Bluetooth playing time, here are some ‘features’ and ‘specs’ to keep in mind that will justify the price for you. These are always subjective and depend on the reader, so we’ll leave that up to you what you think is important: active noise-cancellation, sound isolation, folding or collapsible, padded ear cups, technical processing built-in, warranties from companies, built-in microphones (do you use your pair to talk on the phone, too? ), control centers (for call control, play, pause, stop, volume and track skipping), color choices, extra bass, ear fins (for exercise and keeping them in place), and a few others we’ll highlight if a pair includes them. Do any of these perk your ears up? 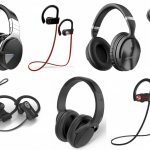 Starting out our list of the best Bluetooth headphones under $200 is the versatile E55BT over-ear headphones by the one-and-only JBL. 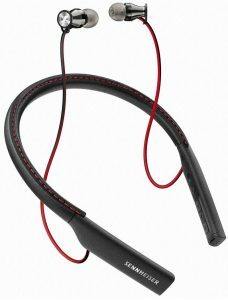 Sporting a fabric headband focused on style and offering numerous different color options, this pair puts a decent emphasis on fashion, without sacrificing the standard ergonomic fit that JBL is known for. Plus, these also come equipped with a detachable cable with a remote and microphone (in addition to the included charging cable) to allow for added convenience in case you’re one to answer some calls on-the-fly (with control center). The E55BT also offers multi-device connectivity, letting listeners easily and quickly bounce between two devices. Though the 50mm dynamic driver and included 1-year warranty is in line with competitors, users praise the JBL E55BT for its long battery life of up to 20 hours, allowing for fewer charging sessions than most. 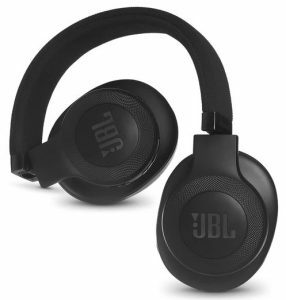 With a competitive price point, the JBL E55BT easily slides into our list of the best headphones with Bluetooth under 200 dollars if you’re in need of a reliable and well-reviewed over-ear pair. 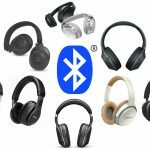 No list of Bluetooth headphones would be complete without an addition from the well-known audio powerhouse Bose, and this list is no exception. The SoundLink on-ear headphones pride themselves on a precise, powerful sound at both high and low volumes, offering a fully immersive listening experience with the added ability to easily switch between two Bluetooth devices. Similarly, with multi-function controls smartly placed on the right ear cup, the SoundLink let the listener easily adjust volume or change tracks without reaching for the device or remote for some hands-free flexibility. Additionally, reviewers love the sheer ease of pairing their Bose SoundLink’s to both PC’s and phones, with many users noting a flawless and stable connection. 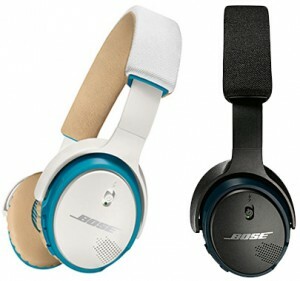 Though situated at the higher end in terms of price-point, by boasting an ultra-light fit, adjustable headband, and cushioned, fold-up earcups, the Bose SoundLink On-Ear headphones are easily some of the best Bluetooth headphones under $200 for those on-ear lovers. Next on our list of the best headphones with Bluetooth under 200 dollars is the SE215-K-BT1 from the audio giants over at Shure. While the SE215 series of headphones offer numerous different options and both wired and wireless versions, the SE215-K-BT1 comes in a black colorway and includes a Bluetooth wireless remote plus mic control. With award-winning sound, the Shure SE215-K-BT1 sports a standard single ‘Dynamic Driver’ to ensure crisp sound and powerful bass. Plus, with their custom sound isolating design (blocking up to 37 dB of outside noise), the listener has some great immersion in music, something we’ve noticed user reviews make sure to note. Though offering easy pairing with most phones, laptops, and tablets, the SE215-K-BT1’s battery life falls short of the other picks on our list, with many reviewers bemoaning the 8-hour lifespan if you can get behind it. As long as you intended to charge these about every other night before you use them you’ll be fine — this is actually in the median of most in-ears with Bluetooth. 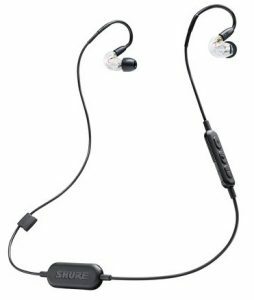 At a competitive price and offering numerous connectivity options and upgrades, the Shure SE215-K-BT1 deserves a spot on our list of the best under $200 Bluetooth headphones for those with in-ear needs. The HD 4.50 headphones from Sennheiser are up next on our list of the best under $200 Bluetooth headphones, and as the reviews note, they don’t disappoint. Boasting their new NoiseGard active noise cancellation on their closed-back headset, the HD 4.50 aims to eliminate outside noise disruption while putting the focus on the vivid, high-definition sound Sennheiser is known for. Fully wireless and fully compatible, these utilize Near Field Communication (NFC) technology to ensure quick and seamless pairing. Plus, with earcup mounted controls and an integrated microphone, the headphones fall in line with most of the best Bluetooth headphones under $200 in the over-ear department and allow for one-handed use without searching for your device or remote. 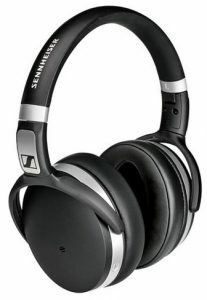 Offering around-ear, ergonomic design and a battery life of up to 25 hours, the Sennheiser HD 4.50 promotes a comfortable, long-lasting listening experience. 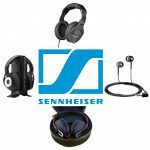 As many user review’s praise these as one of the top travel headphones around, the Sennheiser HD 4.50 is definitely one of the best headphones with Bluetooth under 200 dollars from a brand we’re all very well familiar with. As one of the best-reviewed audio companies around, it’s no surprise that Bose shows up again on our list of the best Bluetooth headphones under $200, this time for their SoundSport Wireless headphones. Though many of the best BT cans may be visualized as over-ear or on-ear, the SoundSport come as in-ear, allowing for increased movement and mobility without sacrificing comfort. Marketed towards athletes and workout enthusiasts alike, the SoundSport wireless headphones put the emphasis on design flexibility and support, ensuring a comfortable fit and precise seal in the listener’s ear to improve audio performance. While the NFC and Bluetooth pairing allows for a wireless connection free of tangled-cords, the design of the SoundSport headphones is purely activity-based, offering a hydrophobic cloth and acoustic ports positioned specifically to resist sweat and rain. As reviewers love these headphones for their sheer durability during workouts, the Bose SoundSport Wireless headphones are easily some of the best under $200 Bluetooth headphones for workout junkies or those who just want protection and versatility. You get about 6 hours of play time here. Continuing our list is another pair of our favorite in-ear headphones and another option from Sennheiser, this time for the HD1. At a higher price point and barely making the cut as one of the best under $200 Bluetooth headphones, the HD1 doesn’t disappoint. Offering NFC for one-touch pairing to most devices, Bluetooth 4.1 and Qualcomm apt-X technology, the Sennheiser HD1 In-Ear allows for ultimate freedom without skimping on true hi-fi, wireless sound. Plus, at 10-hours, the battery life falls in line with others on our list and is on the higher-end of in-ears around this price-point. Additionally, as fit is of paramount importance when choosing an in-ear headphone, this pair offers four different ear-adapter sizes, ensuring a snug, comfortable fit. With a custom neckband headset stitched with sheepskin nappa leather (and lined with a three-button remote and microphone), stainless steel sound tunnels, and earpieces finished with mirrored chrome, the Sennheiser HD1 In-Ear is definitely one of the more luxurious options on our list of the best Bluetooth headphones under $200 if your budget is at the maximum of our cut off here today. 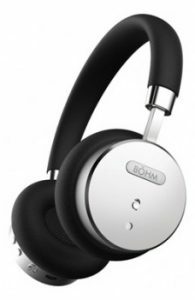 At a lower price point than many others on this list, the Bohm prides itself on their passive and active noise cancelling technology with ambient noise reduction, boasting an undistracted and focused listening experience with the flip of a switch. Similarly, with a focus on hands-on controls, the Bohm B66 features multi-functional buttons set discreetly into the headset itself, allowing for easy volume control and playback. Additionally, with a battery life of up to 16 hours (8 hours with noise cancelling activated — that tech really drains battery), the B66 finds itself with an average lifespan than the majority of the best headphones with Bluetooth under $200. However, though advertised as a lightning-fast 2-hour charge, many reviewers flagged this claim as slightly exaggerated. Still, with leather and metal finishes, cushioned ear pads, and a fully adjustable headband, the Bohm B66 earns a spot on our list of the best headphones with Bluetooth under 200 dollars with an overall solid presentation of features. 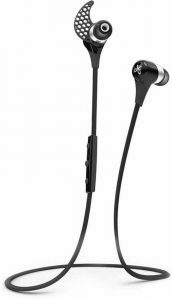 A newcomer on our list of the best Bluetooth headphones under $200, the JayBird BlueBuds X Sport is an in-ear headphone at a much lower price range than competitors on this list, specialized for athletics. With ‘Shift Premium Bluetooth audio’, the BlueBuds X Sport claims to offer a great sound that outperforms most in this price-point. Though some reviewers disagree, most praise the addition of SIGNALPLUS, a feature that allows for skip-free music without signal dropping no matter where the device is carried. As one of the smallest options on our best headphones with Bluetooth under 200 dollars, the JayBird BlueBuds X Sport still boasts an impressive 8 hours of continuous play time. Plus, with their custom X-Fit design, the BlueBuds X Sport can be worn either under-ear or over-ear, allowing for a customized fit whether exercising or relaxing. 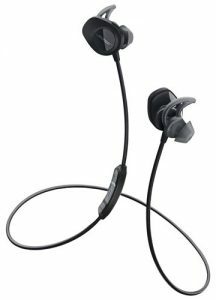 As many users have praised their durability and comfort, the JayBird BlueBuds X Sport deserves a spot here towards the end. Though the name may be a mouthful, you definitely know the company behind the MDRXB950BT. 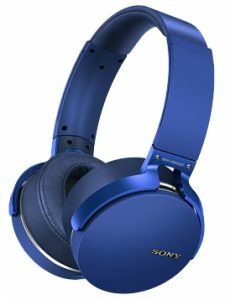 Though this is their first offering on our list here today, Sony is known for producing some of the best headphones available, and these are no exception. With a focus on bass (the XB stands for EXTRA BASS), the MDRXB950BT sports 1.57 in neodymium drivers paired with sculpted air vents and a ‘Electro Bass Booster‘ and ‘Beat Response Control’ to produce some extra, deep bass. As with many of the best Bluetooth headphones under $200, these Sony’s offer one-touch listening through NFC and built-in Bluetooth. However, they also set itself apart by offering a battery-powered enhancer to increase low-frequency sound through ‘Digital Signal Processing’, resulting in a more dynamic and powerful listening experience. With a one-button control and fully smartphone-friendly, the Sony MDRXB950BT makes its case in the affordable over-ear Bluetooth department. Wrapping up our list of the best headphones with Bluetooth under 200 dollars is the Phiaton BT 220 NC, and with good reason. Voted the “Best Wireless Earphones with Mic” by Twice Picks Awards, the BT 220 NC are jam-packed with some of the most desired headphone features available, including: Bluetooth 4.0, active noise-cancellation, NFC technology, and multi-point connectivity, to name a few. Many reviewers love the powerful active noise cancellation of 95% and praise these as some of the highest rated earbuds around, noting their Amazon rating of over 4-stars. 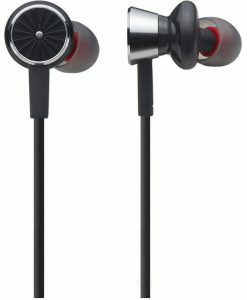 Similarly, many people note the extra-long 10 hour in-ear battery life (17 hours with Noise Cancellation off) and included 4x sets of silicone ear tips to ensure a snug fit. Plus, at a price point right in line with competitors, the Phiaton BT 220 NC easily earns the last spot on our list of the best Bluetooth headphones under $200.